GUARDIANS OF THE GALAXY casting alert! 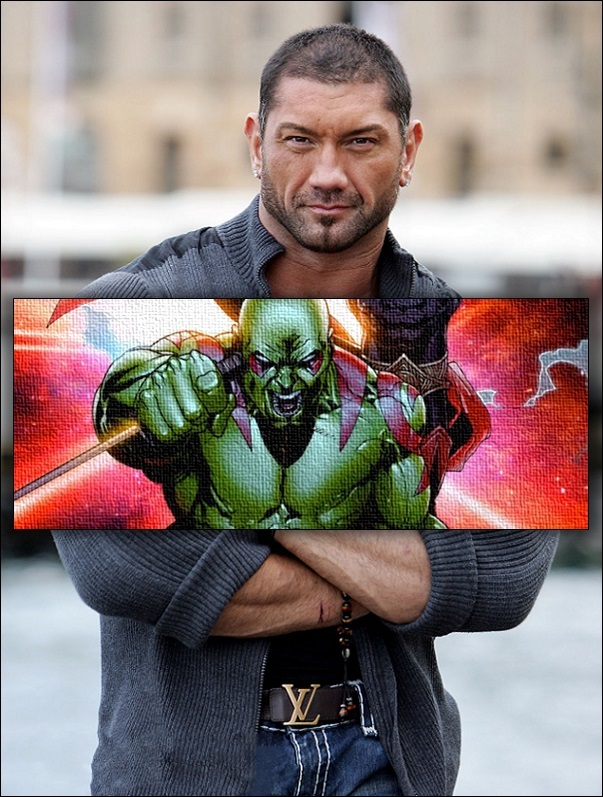 Drax the Destroyer is…..
…. former WWE wrestler and THE MAN WITH THE IRON FISTS actor Dave Bautista. The Hollywood Reporter is reporting that Marvel and James Gunn have found their muscle for their outer-space epic GUARDIANS OF THE GALAXY. Bautista makes only the second casting announcement thus far. With Star-Lord already cast (Chris Pratt) and now Drax, this just leaves the rest of the core team to be cast. They include Gamora, Groot and Rocket Racoon. This will not be Dave Bautista’s first foray into movies as he has had a few small roles like a bit part in THE SCORPION KING before taking the role of Brass Body in THE MAN WITH THE IRON FISTS. He is set to hit screens later this year across from Vin Diesel in RIDDICK. It was believed that Jason Mamoa (CONAN THE BARBARIAN, GAME OF THRONES) had the high road towards the job, however, Bautista won out. Other contenders for the job reportedly included Isaiah Mustafa (the OLD SPICE guy) and Patrick Wade. Again, as we noted in our first casting announcement for GUARDIANS OF THE GALAXY, no villain has been announced yet for the film, however many believe that it will be Thanos, the secret, mid-credits, bad guy teased in last year’s THE AVENGERS. So, what are your thoughts? Are you happy with this casting? GUARDIANS OF THE GALAXY will be directed by James Gunn and so far stars Chris Pratt.